What Is Matcha? And Is It Healthy? According to science, matcha is something of a miracle supplement. But more isn't always better. Though its origins trace back over thousands of years in Japan, the café menu item of this very moment is matcha. Matcha-infused innovations such as matcha muffins, matcha pancakes and matcha drinks are sweeping the nation…it seems like everywhere you go it’s matcha, matcha, matcha. What is it about the magical, mystical properties of this ground green tea that makes it one of the most desirable ingredients among the fashion and wellness warrior set? Is it a legit health boost that should be integrated into your daily regimen? Or a health fad doomed to fall by way of coconut oil? Matcha is not just exotic in sound but in formulation, ranging from lower “cooking grade” powders to more expensive “ceremonial grade” powders, with enough selection to agonize over when choosing one to top your chia pudding. To get the best quality matcha (according to the matcha set, it matters), make sure your matcha is bright green — the greener, the better. The darker the matcha, the older the matcha, and its beneficial properties weaken over time. On the same note, another study performed on mice, found that drinking green tea does, in fact, reduce stress and curb the bouncy jitters one might get from drinking a caffeinated beverage. Mind you, green tea is caffeinated and matcha is an even more caffeinated form of green tea, containing approximately 34mgs of caffeine where traditional green tea averages at about 30mgs and an espresso has around 60mgs, but the L-theanine in matcha prolongs its mood-boosting effects. There was also much hype that the winning caffeine and catechin combo stimulates the nervous system, which is said to rev your metabolism by stoking the thermogenesis (burning stored energy) process and fat oxidation, though only ever so slightly. A piece on NPR revealed the increase is practically negligible and can’t be sustained over time. “The research is still in the discovery phase on matcha but seems as though our ancient ancestors got it right with this one,” she says. 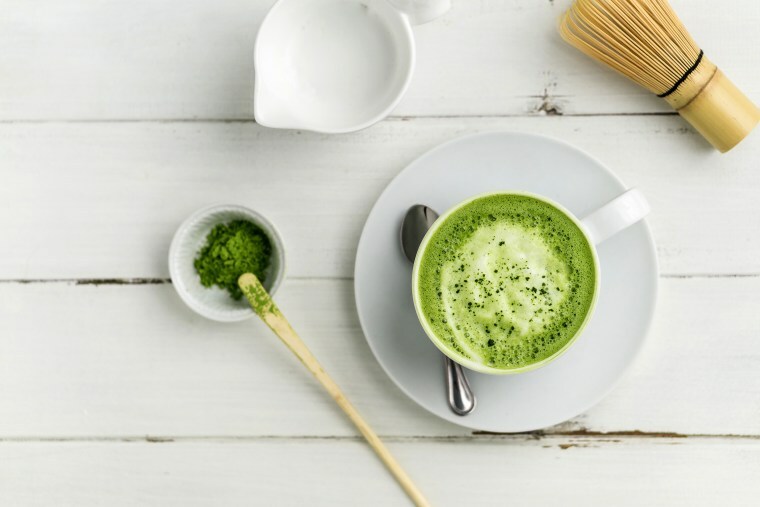 Though matcha is a “nutritional powerhouse,” Janie Zeitlin, a registered dietitian in White Plains, NY and New York City, says it’s not for everyone, and that pregnant and nursing women should skip it altogether. “Consuming too much of this potent antioxidant has been linked to decreased iron absorption, lead contamination, liver damage if taken with acetaminophen and to altered effectiveness of prescription medications. In fact, these adverse effects may be three times as likely to occur when drinking matcha as opposed to brewed green tea,” she says.